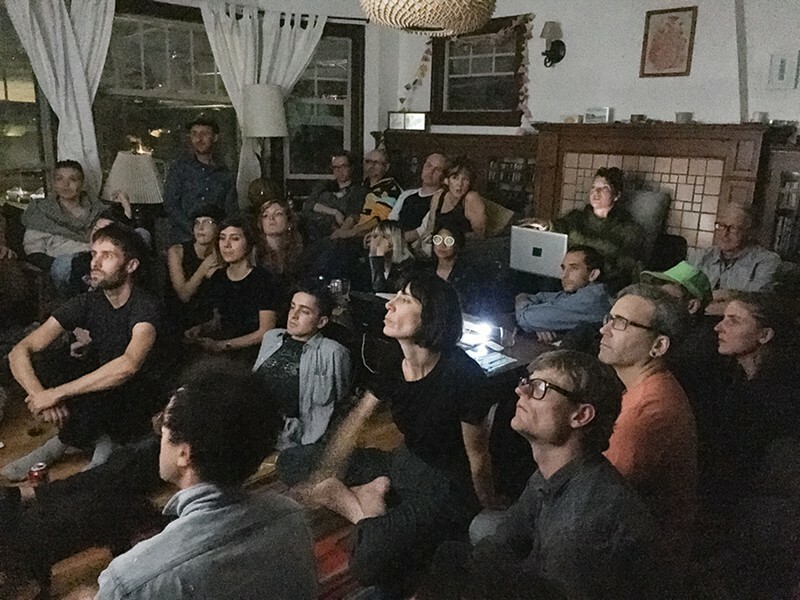 At the monthly discussion, artists gather in Bay Area living rooms to discuss new media. Courtesy LRLE At Living Room Light Exchange, informality is key. 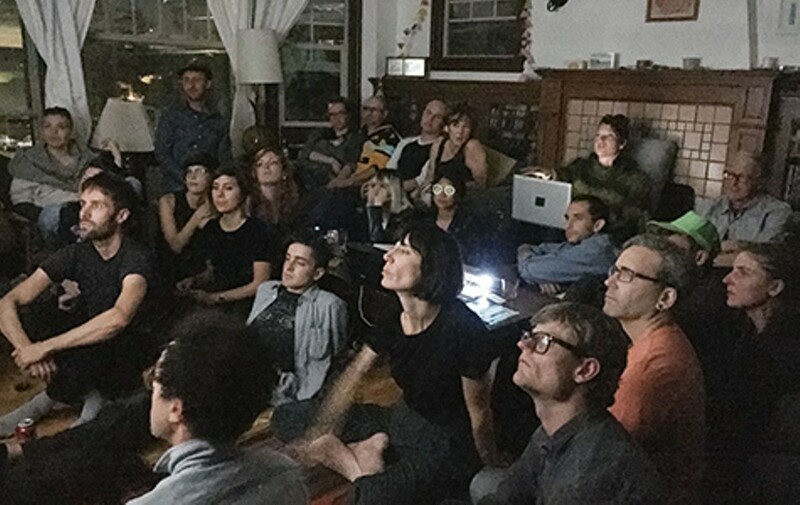 At the latest Living Room Light Exchange, some forty intellectual types sat on a sprawling rug inside an artist's live-work space in West Oakland. The reflected glow of an idle projector draped the attendees in blue light as they sipped wine and craft beer. Group conversation flowed, covering topics such as the nefarious deeds enacted inside the sleek casings of tech-company headquarters and temporary tattoos that allow you to control your devices by pressing your skin. It also represented something rare in the Bay Area: a dialogue in which art and tech were not assumed to be inherently opposed. In fact, that night launched the third year of the monthly salon for people working in — or at least interested in discussing critically — the intersection of art and technology. Recently, attendees of the Bay Area version launched a branch of the series in New York City, and according to organizers, more can be expected in Tel Aviv, Berlin, and Dublin. Elia Vargas and Liat Berdugo, both Oakland-based artists and curators, started the event two years ago. After meeting at a conference in New York City in 2012, the two eventually reconnected in the Bay and began envisioning an environment in which artists and academics could casually workshop each other's projects — an informal setting in which every contribution would be equally valued. Living rooms were an obvious fit. Before last week's salon, Vargas and Berdugo sat on the floor of that night's venue, comfortable behind a wooden coffee table. Vargas, a current UC Santa Cruz doctorate candidate in Film and Digital Media, wore a patterned button-down with round glasses. Berdugo, an assistant professor of Art and Architecture at the University of San Francisco, was in a leopard print blouse, her curls loosely but elegantly pulled back. In vocabulary both scholarly and poetic, Vargas explained that while conferences and artist talks are important, he and Berdugo yearned for a space in which "a gathering of critical engagement could be playful and generative, and not necessarily a product of an artist's labor." "We are thinking about the non-commodifiable spaces," Berdugo continued. "Thinking about, 'What is it like to not be in a gallery? What is it like to not be in an institution? What are the ways that you can create networks of places that are outside of institutions and inside of intimacy?'" The salons do capture an intimate atmosphere, not unlike a dinner party. There's free pizza, and every guest is asked to bring beverages to share. Each edition takes place in a different Bay Area living room — most often in Oakland and San Francisco, but occasionally in other East Bay cities. The rotation is key to creating a welcoming environment and an equal playing field, because even regulars will always feel a little bit like newcomers. As Vargas put it: "Everyone needs to ask the same questions, like, 'Where's the bathroom?' over and over again." Salons, which happen every third Tuesday of the month, are never advertised on social media. Rather, addresses are sent out via a newsletter that anyone can request to join. Over the past two years, the event has grown almost solely by word-of-mouth, the organizers said. The duo began by emailing about fifty of their friends. Now, the update goes out to about four-hundred people, and around forty typically show up. Despite shifting locales, every salon follows a set schedule: They start with forty-five minutes of mingling; then come three short presentations, each followed by discussion. There's an intermission, then a long conversation at the end that ties all of the presenters' practices together. The artists are never asked — in fact, not even allowed — to have their presentation approved by the curators beforehand. The only parameter: No formal artist talks or career retrospectives. Each person must share half-formed projects that they're working on at the moment. Last week, presenter Eric Paulos sat in a Navajo-print arm chair near the center of the room, his computer on his lap. The UC Berkeley Electrical Engineering and Computer Science associate professor and former multidecade member of the infamous anarcho pyro-technics group Survival Research Labratories, chatted about the possibilities for creating clothes that change patterns throughout the day by using thread that channels microcurrents of electricity. He also presented half-baked plans for creating "Energy Parasites": toylike devices that stick onto busses, escalators, and public fountains, harvesting their energy for later uses, such as charging one's phone. The clunky objects aren't necessarily useful. Rather, they function more like works of art: prompting the viewer to reconsider something they take for granted, or for which they have a prescribed framework. In this case, that's energy and ownership. Although the presenters vary widely — past guests have included legends Jim Campbell and Chip Lord — Vargas and Berdugo have one requirement: projects must not use new media merely as a means for creating spectacle. While the Bay Area — and particularly San Francisco — is saturated with what Berdugo referred to as "blinky-blinky art" and "put-LED-on-it art," the Light Exchange showcases work that uses technology self-reflexively, questioning and even undermining the medium, as a way of gaining insight into digital culture and its consequences. That type of work is especially important in the Bay Area, where feelings about tech are polarized. While one side maintains, in Berdugo's words, "a faith in singularity, a network optimism, a connective dream, [and] an efficient, robotic future," the other reacts with "technophobia, Luddism, a 'no-one-knows-how-to-have-a-conversation-anymore,' ... a surveillance state, and so forth." But the conversations at the Light Exchange deliberately fall in the middle, at once invigorated and horrified by new media's immense potential. After Paulos presented a project about networked devices (think "The Internet of Things"), a self-identified Apple employee spoke up to urge him to seriously consider the moral responsibilities of developing such technology. Afterward, during the intermission, a group of attendees weighed the disease-fighting capabilities of human-gene editing against the ethical dilemmas it creates. Conversation was punctuated with hyphenated terms such as "design-noir," "retro-futurism," and "techno-positive." The dimly lit gathering felt like a clandestine club — a refuge for tech workers too critical of their industry and artists too interested in tech. Foremost, though, there was a constant buzz of excitement — a thrilling sense of inspiration — as if, together, this cohort could create a future in which the mechanisms of technology are not abstract and opaque, but as playful and accessible as Play-Doh. "I don't want to live in a world where everything is optimized and solutionist," said Paulos at the end of his presentation, "That's just not a very human way of living in this world."